This shampoo can cure your white hair problem, dandruff and fallen hair. It just need 7 minute to have black hair. This shampoo made from combination of herbal. Just Use 1 sachet you can have black hair. It's combination shampoo and conditioner. Including various Chinese medicine essence and herbal nourishing cream such a, wild ginseng, wild ganoderma lucidum and so on. The Black hair magic took the hair nutrition and healthy experts two years to developed it. Combined with various fruit gathering essence, Amino Acid, ZPT, Collagen, etc, it contains a kind brand new formula that rapidly turn your hair black. Meanwhile it can dispel the stubborn dandruff, supplement nutrient to the root of the hair and ineffectively prevent hair losing. Safe and healthy, without hair dye and won't turn red, thus become the best product for hair styling. 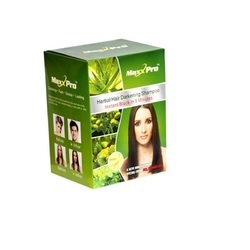 The product is very good in treating your hair and give natural nutrition to your hair root. Black Hair Magic Shampoo is the idea answer for many of the hair problems faced people today such as hair loss, hair whitening and dandruff. If you are looking forward to get good natural herbal hair colour then your search ends here. In India Black Hair Magic Shampoo is a very hot product in market as there is no other product which is proved to be as effective as this one. It gives the best treatment to your hail scalps which is the perfect solution for almost all hair issues. Being a herbal product Black Hair Magic Shampoo is completely free of side effects. If you are here for making your hair get back its natural colour then you will get that just in a matter of 8 – 12 minutes which is really impressive. Not many hair dye suppliers in India can give such an offer to you and thus this product is simply best the best form of natural hair dye. •Best price and good quality. •Simple to use, like normal shampoo. •Do not hurt hair root. •Provides Essential Nutrients to Hair Roots.